By offering professional expertise, the Selig Suffolk Trustees enable these projects to focus on their core activities. Selig Suffolk’s trustees are experts in business management, financial management, legal support and Church leadership. Selig Suffolk employs a full time Manager, Julia Hancock, to ensure that each project has a strong framework. She oversees the projects, supports their monitoring and evaluation, creates and maintains polices and procedures, implements quality standards and recruitment and retains volunteers. Julia has 10 years of business management experience plus 15 years of charity management experience in 4 very different charities. Selig Suffolk also employs a full time Support Worker, Marlene Scrivener. She is responsible for identifying and referring potential Night Shelter Guests and Hope into Action Tenants. She works with guests and tenants to improve their relationships and housing options. Marlene trained as a Nurse before working in community health. Rob Darrington: Vice President of Marketing for a manufacturer of specialty scientific equipment. Rob has volunteered as a leader with young person’s holiday camps and is also a Trustee for a local educational charity. Clare Barlow: A Partner at Christchurch Solicitors LLP based in the centre of Ipswich. Previously Clare had a senior management role in the NHS after training as a nurse. Jonathan Goldthorpe: Member of the Institute of Chartered Accountants in England and Wales and Finance Director and Chief Operating Officer at an insurance company in London. Mervyn Dye: A retired Management Accountant, Mervyn is the lead Trustee for Ipswich Hope into Action. He is a Church of England Reader and he champions our Hope into Action project. Reverend Carol Mansell: An Anglican minister looking after five parishes in and around Monks Eleigh in Suffolk. Also the World Development Adviser for the Diocese of St Edmundsbury and Ipswich. Andy Turpin: Is one of our volunteer night shelter church coordinators. Andy has a professional background in IT service, project and team management. 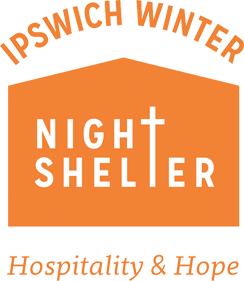 He champions the work of our night shelter. Reverend Canon Charles Jenkin: The Anglican minister at the Civic Church in Ipswich, St Mary le Tower. Also the Rural Dean for Ipswich.